Much like the high definition digital progressive lens, this lens gives you a clearer picture, only it is for single vision wearers. If you wear contacts more than your glasses but are looking to change it up a little, this lens is perfect for you. It will make the prescription look exactly like how it did in the exam room. It is that precise! Our Advanced Single Vision takes advantage of our in-depth knowledge in personalized ophthalmic lens design to reach the highest performance for Single Vision lenses. The lens designers have engineered a Single Vision design with capacity to produce any type of Single Vision free-form lens, no matter the frame, material, base curve or prescription. Conventional Single Vision lenses for high prescriptions have the weakness of losing visual clarity when looking in lateral directions. This inconvenience is caused by oblique astigmatism, and its correction is essential for providing clarity and comfort. With our High Definition Single Vision lenses people with high prescription will notice a notable improvement. When a lens is tilted the visual quality experienced by the the eye becomes diffuse, it is no longer clear for all directions of sight. The only way to avoid this problem is to calculate its surface, considering from the beginning that the lens will not be positioned perpendicular to the principal gaze direction. 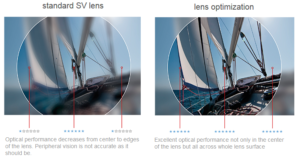 Thanks to new technology our sports lenses provide impeccable visual quality in the entire lens surface, providing clarity and high definition in all gaze directions. Developed for use in high-wrap frames, these lenses provide superb vision in sports frames. When choosing between a conventional progressive and a high definition digital progressive lens, consider the differences between a high definition television versus a tube television. As time changes, technology does as well. With a high definition digital progressive lens you will experience customisation at its finest, providing you with clearer vision in every gaze direction. Eliminating more distortion will enable you to balance your far and near vision with ease. An innovative design that reduces visual fatigue! Let your eyes rest when reading, working with computers, or playing video games. We offer an anti-fatigue design that has been calculated to reduce visual fatigue produced by a continuous accommodation effort. When working constantly at near distances muscles that surround the crystalline lens become tired, and this may end in visual fatigue. The most common symptoms of visual fatigue are pain, dryness, redness and even headaches. Anti-fatigue lenses reduce the weakening process of the aforementioned muscles because they provide the wearer with a small touch of addition in the bottom part of the lens. An office lens is an occupational lens exclusively for intermediate and near vision, making it perfect for computer and office work. Ideal for professionals who spend a lot of time working at near & intermediate distances, our office lens offers an extremely wide near vision region and a soft design that eliminates perceived lateral distortion. This perfect union reduces the adaptation period to almost immediate, allowing a natural posture when working on computers.